Click a phrase to jump to the first occurrence, or return to the search results. Enough about me! In the last few weeks, we have been continuing with trials. A week alongside sorting out a long list of engineering, manpower and logistic issues as well as catching up with all our own administration and, for some, a bit of leave. We sailed on the Tuesday after the Easter Weekend, intending to embark the helicopter and then start first-of-class flying trials. Unfortunately, we had to wait for a few days until everything was ready to go – we certainly work out helicopters hard and it took extra time to prepare it for DARING. Nevertheless by Thursday we were off and have flown up to 8 hours per day ever since. 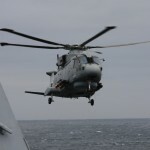 The trials involves flying a MERLIN helicopter equipped with a great deal of instrumentation that measures how hard the aircraft and the pilots have to work to land on the ship. We test approaches from Port and Starboard sides of the Ship with the wind from all relative directions – ahead, from the side and astern – in a range of different wind strengths and pressure conditions. Most frustratingly, while the South of England and most of our families were basking in unseasonably good weather, we were searching for gales about 300 miles North West of Ireland. So we have bounced around often quite unpleasantly. The output from the trial is a plot of acceptable wind speeds and directions so that for the next 30 years or so while Type 45 are operating, the Ships can give winds that will allow the helicopter to land safely whilst not restricting unnecessarily what the Ship is doing, for example, protecting a Carrier from missile attack while the helicopter needs to land on for fuel. The helicopter came with a team of clever technicians and 3 Test Pilots. The theory goes if these pilots were struggling then the average pilot would not be able to cope. And we certainly made them work: At one stage we were sprinting at about 25 knots into a Sea State 7 with over 60 knots of wind over the deck and the ship rolling and pitching violently……it all looked very difficult, but if there is one thing about aviators they manage to still sound calm on the radio circuits whatever is happening in their trousers! We hope to finish the flying trials by the end of next week and then switch to lots of gunnery, more radar trials and then onto SEA VIPER with a vengeance. Of course it would not be a warship if there were not plenty of activities going on to keep us all amused . 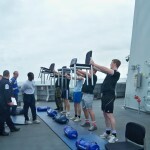 Quizzes, inter-mess socials and a sporting event or 2, notably the T45 strongest man and strongest woman competition. So that is it. A year of involvement in the most exciting Defence Project of the current decade. I hope those that have read this have witnessed the rapid maturity in the Ship from the time that the Ship’s Company moved onboard and spent 2 hours in total darkness, through the first fragile days at sea off Scotland and then a gradual increase in the tempo of trials and the start of warfighting skills. There is plenty more to do and my successor and the Ship’s Company will certainly not be bored! 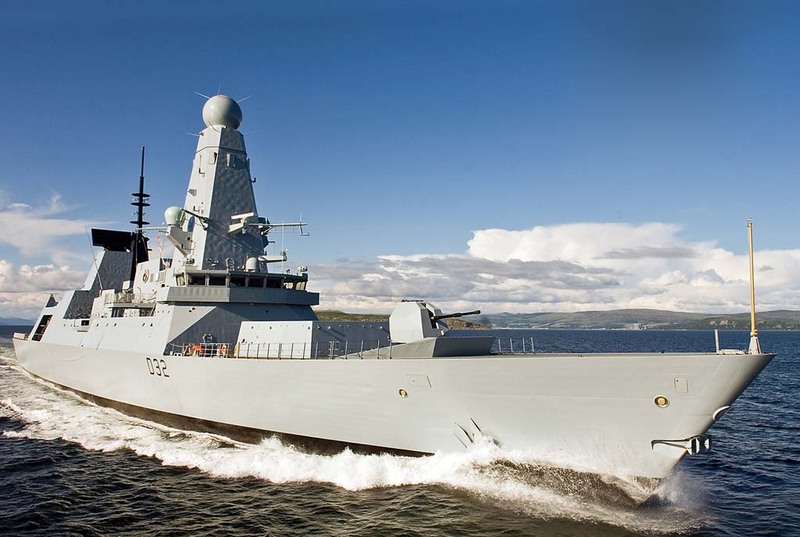 Best wishes and thanks for your interest in Type 45. It is something that the UK can be justifiably proud. Related to aviation, Bennett, COMUKATG, HMS Daring, Merlin, Sea Viper, T45, trials. My name is Captain Paul Bennett, I joined the Royal Navy in September 1985 and spent the first 15 years my career in sea-going appointments. Ashore, I have served in the rank of commander as the Fleet Operations Officer and as the maritime desk officer to the Director of Operational Capability in the MOD. I assumed command of HMS Daring, the first T45 destroyer, in May 08. When not kept busy by my family, I maintain ‘enthusiastic amateur status’ in my sporting interests of running, mountain-biking, sailing and rowing.